Newcastle Waters was once the drover's crossing point where stock routes from the east and south met. It was also departure point for the feared Murranji Track, a notorious stock route with long stages between water for cattle. A number of old buildings from the droving days remain and are well marked with interpretive plaques. 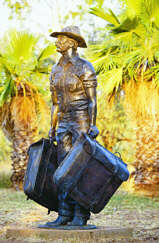 See the famous Junction Hotel/Store and the Drovers Memorial statue dedicated during the Last Great Cattle Drive in 1988. Its set in the middle of a working station and well worth a visit.